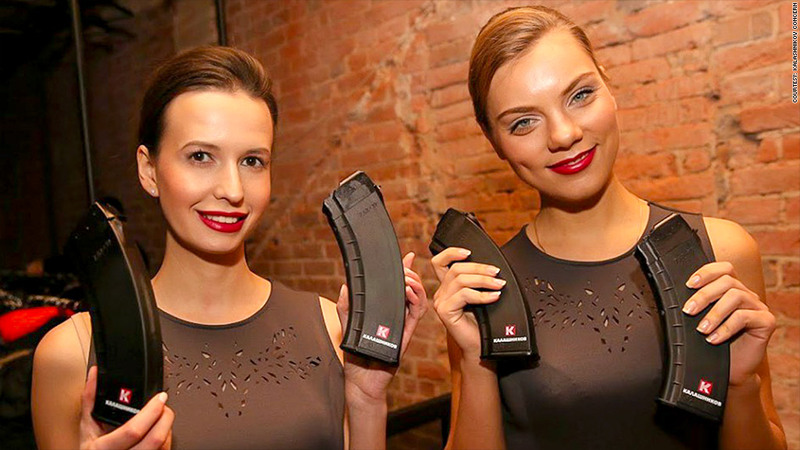 Women showcase the new Kalashnikov branding at a launch event in Moscow. Here's another ripple effect of Western sanctions on Russia and the country's troubled economy: Gun maker Kalashnikov is giving its famed weapons and brand a makeover. Its sales suffering, Kalashnikov on Tuesday unveiled new-look combat weapons. It also said it will introduce clothing and accessory lines. The launch, which came complete with girls in tight fitting dresses brandishing machine guns, was designed to whet the world's appetite for assault rifles. The AK-47 maker was among the first Russian companies to be slapped with trade restrictions over the country's incursion into the Ukraine. Kalashnikov has been banned from importing its guns into the United States. That's resulted in a sharp fall in firearm sales in the world's biggest gun market. The plunging ruble is providing yet another headache for the company, which posted a £1.7 billion ($2.7 billion) loss in 2013. To offset losses in the U.S. the weapons maker wants to push into new markets in Asia, South America and Africa. It says the "most promising" countries are India and Egypt. Plus the rifle maker has a new slogan: protecting peace. The company said Kalashnikov weapons are made "to maintain peace around the world." "They help nations protect their sovereignty, their right for peaceful existence." Americans love Kalashnikovs. Before the sanctions, the company said pre-orders for its civilian weapons were three times the number of annual deliveries.